I have absolutely no need for a new pair of boots. Over the years, I've collected them all: snow boots and wellies, ankle-height and tall, brown leather and black suede, flats, wedges, and heels. But if I were to start all over again, there would just be these — one boot to rule them all. 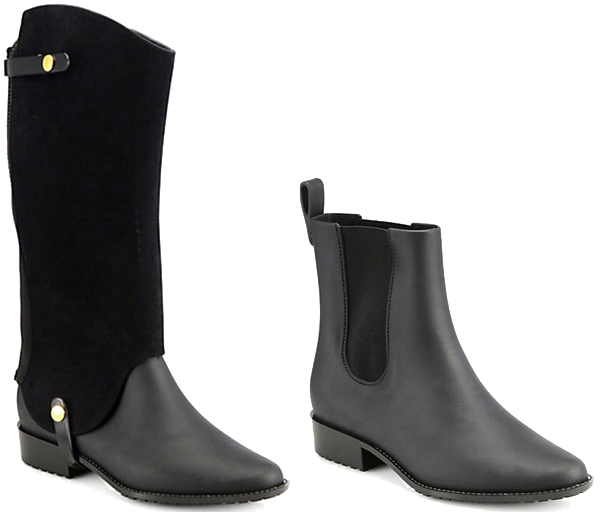 Featuring a removable shaft, this pair from Melissa goes from knee-high equestrian style to Chelsea ankle boot in a snap. And, despite the look of leather and suede, the boots are actually made of waterproof PVC, which means they can take you straight through a New England winter with just the addition of some cozy socks. They also come in brown and in high-shine color combos, but the pair I've chosen here are on sale. You can thank me later. omg, i have the biggest crush on these boots. i have been debating whether to buy them toootally. ugh. Fantastic boots. Two in one, brilliant!! You always find the most amazing pieces Marissa! !